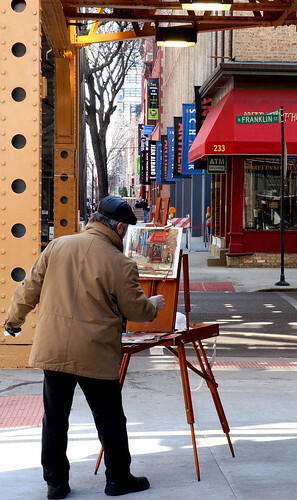 >I was in Chicago a couple of weeks ago for my friend Jon's graphic design display and saw this man painting. It was a really cool area and actually there were a few different guys painting things at this intersection. I've never really just snapped pictures of random people on the street so I was kind of nervous, and I was half expecting him to turn around and start yelling at me! But I fired off a few shots and got one that I really like. So I'm totally excited because I leave on Monday for Florida for an entire week!! I can't wait! I'm going to be relaxing on the beach and hopefully taking some awesome pictures. Stay tuned!